Welcome to the final 2017 link-up for Gifted Gorgeousness. The linky will stay open until the end of the year so you have plenty of time to link up and join in. Two gifted finishes this month and another one imminent. So now I hand over to you. This is where you link up your post for this month. Please use your name or your blog name in the field and NOT the words "December Update" so I can easily see who has linked up this month. And link to the actual post, not just your blog. It is easier if you copy and paste the link, rather than typing freehand. Finally, the Advent Calendar is going well again this year, lots of beautiful festive stitching and some great ideas for how to spend Boxing Day. I feel that this celebration could catch on in America if we all promote it right! We still have 9 doors to open, with some being double door days so keep checking back each to see the latest picture and link. Great gifts, Jo, and beautifully stitched! Lovely stitching.The Dracula design is great and 12 drummers drumming looks fantastic. I always love seeing your wonderful projects. Witches looks great! As I said before, I love seeing it on linen! Congratulations on your finishes. Love the witchy stitch, and the fabric for Dracula is so lovely! Can't wait to see your finished 12 Days of Christmas. Hooray for GG! I look forward to joining in again next year; I've missed it. Your stitching for this month is lovely. Witches is such a fun little stitch. Are you on the beading part of 12 Days now? Lovely finishes, the Just Nan turned out so pretty with the different shades of pink. Your drummer looks fantastic. Is that snowflake done yet? You can do it! Beautiful work on your pieces. Love that fabric!! Oh congratulations on your finishes! They are all so lovely! I can't wait to see your 12 Days complete, each section you have showcased look wonderful, especially this one, I think it's my favorite! Thanks for a wonderful year, Jo! 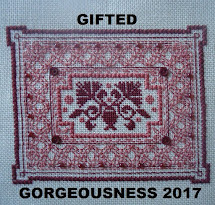 I have enjoyed participating in the Gifted Gorgeousness challenge again this year. I posted on the 15th and then kept forgetting to link up...but I'm here now! LOL I'm looking forward to other challenges you are thinking up for next year! It's so satisfying seeing finishes. I have enjoyed taking part in GG this year. Thank you Jo for hosting this. No entry from me this month, nearly no stitching going on at the moment. Great gift progress this month! I'll probably post mine in a few days. I've really enjoyed being part of GG this year. Tee hee, I'm late as usual too! I love all the beads you've used on "Memories"! Thank you for holding GG and inviting us all to join in ..... It's been great fun!